your registration will be approved and you will have full access. has not logged in to the site? We will send them an invite to the site! The message forum is an ongoing dialogue between classmates. There are no items, topics, subtopics forbidden but please use extreme caution and common sense with politics, religion, foul language and risque subjects. Forums work when people participate so do not be bashful! Click the "Post Response" button to add your entry to the forum. If you have a clue about where these friends and former classmates are, PLEASE let us know. All we need is a former mailing address or email - even a city and state or even a licensed occupation often helps us track them. Click "Contact Us" at the top of the page and send us a message if you can help. PRIVACY NOTICE: All contact information (address, phone number, e-mail address) entered into this Website will be kept confidential. It cannot be seen by classmates (other than website administrators) unless you grant permission on your profile. Your email address is not visible, although an email can be sent to you using the private message contact box at the bottom of your Profile picture. Note, however, if you send a message to someone through their Profile page, the Classmate will see your email address so that they can respond. 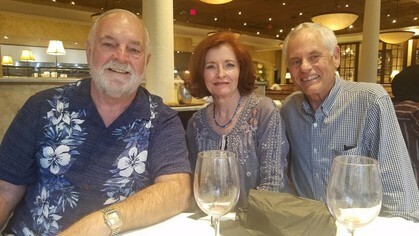 JIM WHITE, KAREN PATTERSON NICHOLS and LOUIS BAGWELL met in North Houston on March 13, 2019 to share memories of growing up in the Utopian town of Roswell. 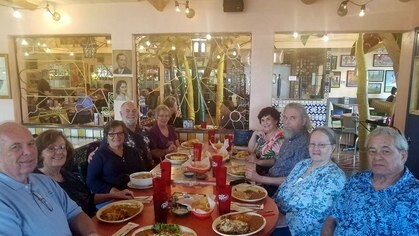 Left to Right, BOB REAM, KAREN HARRINGTON REAM, KATHY WHITE, JIM WHITE, MICHAELE AUSTIN KELLY, MARY VEATCH, BUTCH COLBERT, SHARON COLBERT, HEARKY VEATCH. March 8, 2019. PLEASE REMEMBER THAT MANY OF OUR CLASSMATES ARE SUFFERING with health problems, financial problems, family loss and more. They are part of your history. If you pray, please do. If you do not, please think good thoughts and send them to the universe.